Being an unemployed in this current highly economic environment is like leading a life without any certain goal and to achieve that goal one should go through a unstable path. And as far as the current employment system considered, clearing an interview and getting hired is meant like being stable with mental and physical instruments. Also going through such tricky interview questions in the interview process is also mentally and physically stress full. Clearing an interview is a process of qualifying different stages in which one should meet all the elements check listed by the employer of an organization. It’s a job market where identifying one perfect job is like aiming at bull eye. Listed below are some unique HR interview Questions to highlight a perfect candidate and their job interview answers that every candidate should be prepared with. 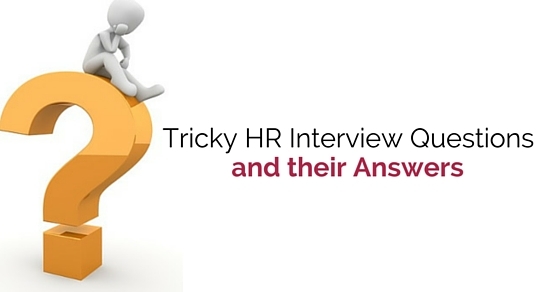 Always remember that answers to HR interview questions should be given confidently. Be confident and accurate about your personal and professional brief. Highlight your achievements and experience emphasizing relevant skills. 2. Why have you applied for this particular job? This interview tricky question is popped because the employer wants to be clear whether the candidate applying for is aware of the duties and it helps him to make decision easy. The candidate should do his/her homework about understanding the job description and be responsible enough to answer the question. This is a common interview question because the employer is trying to know whether the candidate will be humble enough to answer it. While answering this top interview question “what are your strengths“, the candidate should be clear and confident such that any question raising from this answer can also be countered. So the candidate should be mentally prepared with the strengths which the organization looking for the post offered. They never should come across as arrogant or egoistic with his/her answer. Explain your strengths with recent professional life event you experienced, which showed your strength in a positive way. This bets interview question can be a game changer, if you answer it smartly. Employer expects the candidate to make one mistake so that the selection would be easy for him/her. While answering always keep in mind your strengths which is showed in a way as weakness. Firstly candidate is supposed to be well read about the company and its needs. Through these needs form your strength based weaknesses. If company needs a candidate with hardworking and time management nature, then answer them that you push your fellow workers to be accurate with their work which eventually can be tough for them. Or else if you getting confused then answer them your likes and dislikes in the form of weaknesses. 5. What have been your achievements till date? This question can be similar to your strengths. Always be able to justify your strength with certain achievement. While answering, point out an achievement which justifies your strength you stated earlier and the result of that achievement to your organization, achievement which is work related and very recent. 6. Why did you change your last job? The main and very essential tip for every candidate is to never badmouth their previous working employer or industry. Always avoid statements like “personal problem”, “personality clash” or “didn’t get along” kind of excuse while answering for your relieving the previous job. If you are currently having a job, don’t be nervous to answer because you are part of that organization and you know in and out of it. But still you are not allowed for such badmouth so it’s better if you state that why would you prefer to find a new job. And never lie about having been fired from the last job. It is unethical so always state that your firing was a result of business or organization crisis. Never stop or pause at this kind of why should we hire you kind question because it’s trump card question. If you stammer or pause then you have blown all your efforts in one moment. If you know employer’s greatest needs and desires, this kind of question will give you a big leg up over other candidates because there will be a better reason to hire you for that particular position other than anyone else. Through this question employer may feels that you may grow dissatisfied and eventually leave the job later. Don’t ever feel that this question made all your effort fail but instead of that teach the employer to look into this question in a different way. Show him/her what’s best for his/her business and also the advantages instead of drawbacks. 9. Where do you expect to see yourself five years from now? It is to understand your goal and your dedication level. It helps employer to understand your focus of life and your commitment to achieve such goal. If you are too specific naming like promotion or etc then you will sound odd. If you are too vague then you will seem unpleasant. Some hr questions for interview are asked to know how ambitious you are. Because being ambitious can never turn you negative. Instead it may turn in your favor as very strong element. 10. Why do you want to work at our company? This question is to know whether the candidate have done his/ her homework about the company. If you answer it well, then you’ll win or else you’ll lose. This opportunity is to hit the ball to the court and grab an opportunity, by explaining them all the research you did on their company details. Best way to understand any details of the company is through their annual report, corporate new letters, suppliers or advertisements etc. An easy question, but the answer should be believable. State as “Absolutely” then provide them the different reason for your absolute confirmation. 12. Are you willing to relocate or travel? Never answer “NO” this may slam all the doors of your effort shut instantly. First find out where you have to relocate and how much travel time is involved. Then respond to the question, if you are fine with it. 13. Why have you changed so many jobs? Your employer fears you may leave this position as easily as you changed previous one. He may be concerned about your instability. Always check your resume first, never mention frequent job change directly with all the details in your resume. It shows your instability. If there are several entries on your resume, consider eliminating the less important ones. Perhaps you can specify the time you spent at previous positions in rounded years not in months and years. 14. How do you feel about shift rotation? This question is asked to see your approach, to see how you react if your shift change after some point of time. So always take these kind of questions in a positive way, because it is asked just to check your approachability. If shift rotation is there you will be knowing it before you start applying for this job. So, if an employer asks such hr question in interview it is just to know your approach. This is to know how well you can make yourself comfortable with your fellow staff. Every organization prefers employees who work accordingly with their colleagues. So while answering this question start with the example of your previous worked organization where you worked comfortably and successfully. 16. Whom you mentioned as reference in your resume, do mind If I contact your previous employer? While preparing resume, always make note that mention only those reference who knows your previous work and credibility very well. Don’t just name any person as reference because a person whom you listed as reference in your resume, should be responsible enough to handle any call received from your interviewed organization. Or you can express your concern by telling them that you would like to keep your job search secret for some valid reason. It’s a very mutual kind of question which both employer and candidate expects to be asked. Therefore, it is always better if you wait for employer that question about salary expectation. Answer the salary related question always confidently. And always expect your salary to be better than your previous job. Mention all those salary details along with the experience. And show it as in the form of hike salary every year. This is to know your knowledge level regarding the position you have applied, may be any general question which they want you to answer. Be honest, even if you do not know the answer and don’t just answer anything. Be accurate and tell them that you are not aware of that answer. It is not legal to ask any candidate about their personal life. Even while you brief them about yourself, only mention about professional experience, skill and nothing else. According to recent government law, an employer is not allowed to ask candidate any kind of personal questions. This is another way get a grip on your weakness or mistakes. Just to disclose your previous mistake. So be very care full while answering this question because eventually being honest can damage many things. A little diplomacy would not hurt anyone. 21. What you didn’t like about your previous job? Its same kind of question as before and answer would be same because you never badmouth about your previous job. This question is asked to know your change of opinion, if you don’t owe anything to your previous organization. It is better to speak about it in a positive way and get out of it safely. 22. Are you happy with your career now? HR interviews are held to understand candidates self-esteem, confidence and career aspirations. Therefore, the answer should be “yes”. If you end up saying NO then it turn into a negative way for your professional life. And whatever your achievements till date will be considered null. 23. How you feel, if your superior or head would be younger to you? This question is asked to check your attitude, it means an interviewer will ask you such questions which may affect your ego. Then an interviewer will clear picture about your personality. While answering don’t ever get intimidated with such questions because it may be stress interview in which an interviewer will put you through some situation to get your honest reaction. Be calm and be honest while answering. 24. What are your other interests or likes? This is really very casual conversation through which an interviewer is trying to communicate with the candidate. By asking about interests and hobbies, an interviewer is considering candidates ability and dedication. So the candidate can be normal while answering this question and even can explain an interviewer about his achievements in such area of interests. 25. What would be your life’s toughest decision? Any candidate will never be aware or prepared for such question because the answer would be really person or professional and it is up to the candidate, whether he is able to handle the answer smartly. Because you never can deny an answer to any question. So it is smart to answer in a way that it’s near to truth but not so far from fake. Therefore to conclude this I would like to give all the candidate one suggestion that to present themselves confidently and also never be afraid of facing an interview. Most of all these kind of question can be or may be asked during your HR Interviews. So it is better to do your homework well before attending any kind of interview because all these tips for interview can help you grow and can eliminate your anxiety or nervousness during an interview. And I wish all the candidates all the very best for their future. Next articleHow to Train your Brain to Learn Fast and Remember More?